Explore core Web service standards, like SOAP, WSDL, and UDDI. XML introductory tutorial consists of a set of interactive lessons that will walk you through typical XML authoring and development tasks -- http://msdn.microsoft.com/xml/tutorial/default.asp . This section of the XML documentation contains information about getting started with XML, as well as using the document object model (DOM). Contains reference topics for each document object model (DOM) object and corresponding interface, each method, property, event, and enumeration in the document object model. Also includes topics about XML errors, schemas, and data types. This tutorial consists of a set of interactive lessons that walk you through typical XML authoring and development tasks. The XML object model is a collection of objects that you use to access and manipulate the data stored in an XML document. The XML document is modeled after a tree, in which each element in the tree is considered a node. Objects with various properties and methods represent the tree and its nodes. Each node contains the actual data in the document. You access nodes in the tree by scripting against their objects. These objects are created by the XML parser when it loads and parses the XML document. You reference the tree, or document object, by its ID value (e.g. <XML ID="MyXMLDocument">). The document object's properties and methods give you access to the root and child node objects of the tree. With the XML Document Object Model (DOM), you can load and parse XML files, gather information about those files, and navigate and manipulate those files. The four main objects exposed by the XML DOM are DOMDocument, XMLDOMNode, XMLDOMNodeList, and XMLDOMNamedNodeMap. Each of these objects exposes methods and properties that enable you to gather information about the instance of the object, manipulate the value and structure of the object, and navigate to other objects within the tree. The tightly defined requirements for XML documents ensure that all applications play by the same rules when they read (technically, parse) and write documents. XML includes tools that allow developers and authors to create common structures that can help provide meaning as well as syntax - schemas - and schemas can help developers build networks of understanding, acting as contracts between all parties. This section contains information about using XSL (eXtensible Stylesheet Language). Microsoft® Internet Explorer 5 supports a subset of the transformation part of the Extensible Stylesheet Language (December 18th Working Draft). Microsoft plans to update this technology to match the final W3C recommendation for XSL. XSL Working Draft Conformance Notes details the differences between the Internet Explorer 5 implementation and the December draft. Contains reference topics for XSL elements, methods, and pattern syntax. Enables you to select from a list of XML source data files and apply a selected XSL stylesheet, then view the transformed XML data file and the resulting HTML. SUMMARY: The XSL Transformations (XSLT) specification defines an XML-based language for expressing transformation rules that map one XML document to another. XSLT has many of the constructs found in traditional programming languages, including variables, functions, iteration, and conditional statements. In this article you’ll learn how to use the XSLT instructions and template rules, manage namespaces, control transformation output, use multiple stylesheets, and employ pattern-matching with template rules. A sidebar explains how to access XSLT from MSXML using the IXSLTemplate and IXSLProcessor interfaces. The earlier release of XSL had some limitations for serious, heavy-duty lifting. The biggest issue was parameters; there was no clean way to change an XSL structure without having an intimate acquaintance with the underlying code in the stylesheet. All too often, the only way around passing information into an XSLT transformation was to put parameters on the XML input. Another issue was retaining information internally about the current state of the processor. If you had XML markup that would be sent to the output stream, you couldn't save it temporarily and use it in more than one place. Finally, there was no real way to save state within the XSL environment itself; you had to take the results from the XSL transformation, filter that out with a document object model (DOM) call, and effectively lose any intermediate states that may have taken place within the filter. The Technology Preview XML parser provides support for the newer XSL-Transformation specification (located at http://www.w3.org/TR/xslt). This newer spec contains a number of innovative features that together make XSLT far more capable than Microsoft's December 1998 version of XSL. The spec also makes XSLT a serious competitor for scripting languages as a server tool. In addition to this, Microsoft has also introduced a new way to integrate scripting code (one that is compliant with the W3C standards, by the way), which may end up changing the way we think about server-side programming altogether. This section lists samples that are available on MSDN Online. This article describes Web Services which are based on open Internet standards, such as HTTP and XML, and the key enabling technologies that ensure services can be aggregated into applications. 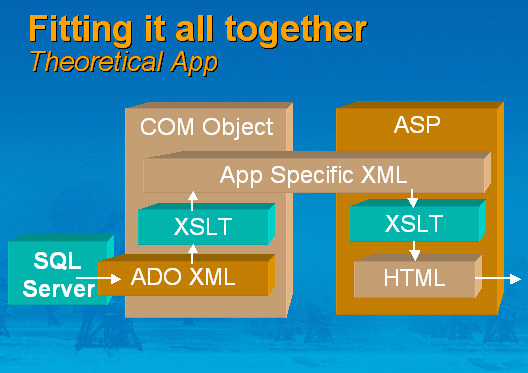 This article offers a lengthy introduction to the topic of using XML in Web applications. Universal Description, Discovery and Integration (UDDI) is a specification for distributed, XML-based information registries of Web Services. Learn how Microsoft will support UDDI across its platform, and visit the UDDI Project Web site to view white papers and a programmer's reference guide. UDDI, the result of a cross-industry project initiated by Microsoft, IBM and Ariba, will enhance and simplify e-commerce and business-to-business transactions. SQL Server® 2000 introduces several features for querying database tables and receiving the results as an XML document. One of the features missing from the SQL Server 2000 Beta 2 release is the ability to express changes to an XML document as database inserts, updates, and deletes. This feature, called updategrams, is available for download. For a more detailed introduction, see What Are Updategrams? While Updategrams are a general purpose XML update mechanism, this release of updategrams uses the updategram format to update tables in a Microsoft® SQL Server™ 2000 database that are mapped to an XML schema with a mapping schema. See the SQL Server 2000 Books Online for an explanation of mapping schema. Since a single updategram may define a change that affects multiple rows in multiple SQL Server 2000 tables, updategrams are a very efficient mechanism for sending updates through a network. Updategrams also allow a programmer familiar with XML, but with limited knowledge of SQL, to make complex changes to a SQL Server 2000 database. Columnist Aaron Skonnard describes the major enhancements made to MSXML since the original, version 2.0. The XML SDK version 2.5 documentation is now available as a single download for your convenience. An overview page with links to several SOAP items, including the SOAP Toolkit, specification, and FAQ. This update provides improved support for passing XML in parameters and improved interoperability with the May 2000 IBM SOAP release. Returning data from COM objects with the SOAP Toolkit for Visual Studio 6.0? The new July 2000 release allows you to return XML structures through SOAP. Walk through sample solutions for returning ADO Recordsets through SOAP with this new release of the toolkit. This article also covers the pros and cons of each solution and sample code for implementation. Learn more about BizTalk Server 2000. BizTalk.org provides a Web-based community that allows organizations to learn about XML and BizTalk, collaborate through newsgroups and other public forums, and get access to training and other valuable resources. In addition, it also hosts a public library to share and store BizTalk document schemas. This library allows organizations to find and reuse business document schemas that are valuable to them, as well as upload their own schemas for use across a set of partners or trading community. Microsoft XML Validation Tool -- This tool is an updated version of the XMLINT command line tool that shipped in the Internet Explorer 4 SDK. It checks that an XML file is well formed. It also uses the new XML DOM to check that the document is valid according to the DTD (or XML-Data Schema). Microsoft XML Notepad -- Beta 1.5, May 15, 1999 -- Microsoft® XML Notepad is a simple prototyping application for HTML authors and developers that enables the rapid building and editing of small sets of XML-based data. With XML Notepad, developers can quickly create XML prototypes in an iterative fashion, using familiar metaphors. XML Notepad offers an intuitive and simple user interface that graphically represents the tree structure of XML data. Working with the standard building blocks of XML supported in Microsoft® Internet Explorer 4.0, authors are able to create reproducible data structures that can be easily filled, allowing greater emphasis to be placed on application development instead of manual data structuring. XML Spy -- the first true Integrated Development Environment for the eXtensible Markup Language that includes all major aspects of XML in one powerful and easy-to-use product. XML Spy is centered around a professional validating XML editor that provides four advanced views on your documents: an Enhanced Grid View for structured editing, a Database/Table view that shows repeated elements in a tabular fashion, a Text View with syntax-coloring for low-level work, and an integrated Browser View that supports both CSS and XSL stylesheets. 30-day trial or $149. XML Instance (below) is probably a competitor product. Turbo XML -- The TurboXML bundle is comprised of XML Authority, XML Instance and XML Console. TurboXML provides a powerful solutions suite for the creation and management of your XML business documents. A single-user license is $270. XML Console -- XML Console enables the centralized batch conversion, validation, and documentation management of schemas and XML business documents within a workgroup. It gives users a configurable command center for the organization and subsequent processing of XML document files. Organizations can now process a single or groups of schemas in all major and emerging XML schema dialects including DTD, XDR, SOX v.2, BizTalk, and a subset of XML Schema (XSDL, Apr 7). XML Console provides companies exceptional control for the streamlined implementation of XML initiatives internally and with trading partners. XML Canon -- XML Canon is a full-featured XML repository for an organization's XML schemas, DTDs, instance documents, style sheets, adjuncts, and miscellaneous files associated with these assets ? the XML infrastructure assets of an enterprise. At the enterprise level, XML Canon provides a collaborative development environment for any XML or non-XML document used for implementation of XML within an organization. The client interface for this server solution is three-fold. (1.) DTDs and schemas creation and editing is done with XML Authority™ . (2.) XML documents are created and edited using XML Instance ™ Both of these applications have the capacity to access and version documents on the server. (3.) Administration, browsing, and custom reporting are accomplished through the intuitive Web-based user interface. This combination provides a comprehensive solution for the management and versioning control required for enterprise level development and exchange -- internally and externally -- of valid XML documents in the XML schema dialect of choice. Extensibility is pleased to announce the commercial release of XML Instance™, XML Console™, and Turbo XML™! We also invite you to sign-up today to be considered for the beta program for XML Canon™. We are confident that you will find our comprehensive solutions invaluable in the development and deployment of your XML initiatives. A suite of solutions for the design, implementation, processing, and management of your XML initiatives. Turbo XML is a bundling of XML Authority, XML Instance, and XML Console. To learn more or purchase Turbo XML contact a sales representative at <mailto:sales@extensibility.com>. with the latest XML developments, schemas, and XML Authority. 919.969.6500 to purchase additional licenses. versions of XML Authority prior to installation. A schema-driven XML business document editor and the ideal platform for the creation, editing, and management of data-oriented XML documents, messages, and configuration files. XML business documents can be generated and edited conforming to DTDs or schemas in major and emerging XML schema dialects including, BizTalk, XDR, SOX v.2 and a sub-set of XSDL (April 7). For a summary of key features see below. To download a free trial version or to purchase a single-user license for $99.95 (multi-user pricing available) visit: http://www.extensibility.com/products/xml_instance/. To download a free trial version or to purchase a single-user license for $99.95 (multi-user pricing available) visit: http://www.extensibility.com/products/xml_instance/. Enables the automated and centralized conversion, validation, and documentation management of XML schemas and instance documents within a workgroup. XML Console will give users customized configurable capabilities and scheduling for the organization, and subsequent processing of XML schema documents. For a summary of key features see below. To download a free trial version or to purchase a single-user license for $99.95 (multi-user pricing available) visit: <http://www.extensibility.com/products/xml_console/. To download a free trial version or to purchase a single-user license for $99.95 (multi-user pricing available) visit: http://www.extensibility.com/products/xml_console/. XML Canon is a full-featured XML repository for an organization's XML schemas, DTDs, instance documents, style sheets, adjuncts, and miscellaneous files associated with these assets ? the XML infrastructure assets of an enterprise. At the enterprise level, XML Canon provides a collaborative development environment for any XML or non-XML document used for implementation of XML within an organization. The client interface for this server solution is three-fold. (1.) DTDs and schemas creation and editing is done with XML Authority™ . (2.) XML documents are created and edited using XML Instance™ ? both of these applications have the capacity to access and version documents on the server. (3.) Administration, browsing, and custom reporting are accomplished through the intuitive Web-based user interface. This combination provides a comprehensive solution for the management and versioning control required for enterprise level development and exchange ? internally and externally ? of valid XML documents in the XML schema dialect of choice. We will begin beta testing for XML Canon shortly so sign up now. I encourage any workgroup serious about collaborating on infrastructures for XML applications to sign up for the XML Canon beta program. To learn more and apply for the XML Canon beta program, visit: http://www.extensibility.com/ea/xmlcanon/overview.html .